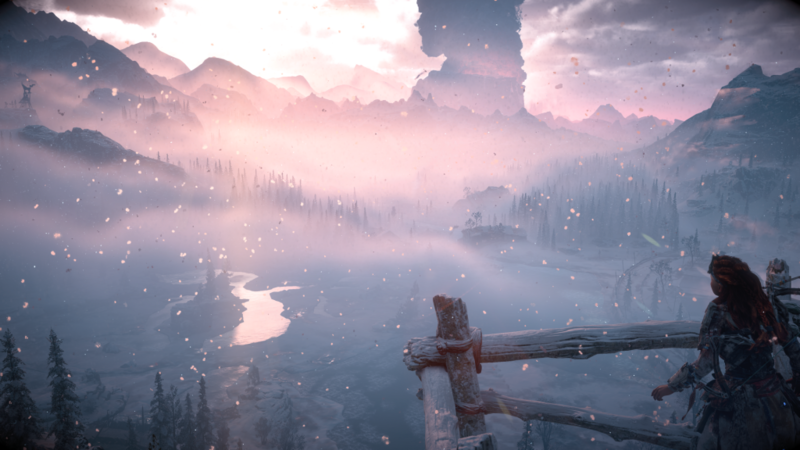 It’s cold, dark, and beautiful as I explore a wondrous new area in Horizon’s The Frozen Wild DLC and it’s the perfect reason to jump back in for season’s players, or something to look forward to for newcomers. Though this has to be said right from the start, don’t expect to be able survive this harsh terrain until players are at a higher level and this is what I would deem is near end game content. It’s worth getting to though, and if players kept their existing finished game save, they should have no problem. Adding a new area to explore that truly only adds to the pre-existing story and not past the end of the first game is a bit disappointing I must admit. The tale of the Banuk tribe is the focus here, and interesting enough. We do find some new details emerging towards the end of this 7 to 10 hour campaign to give perhaps hint at bigger things for an inevitable sequel. 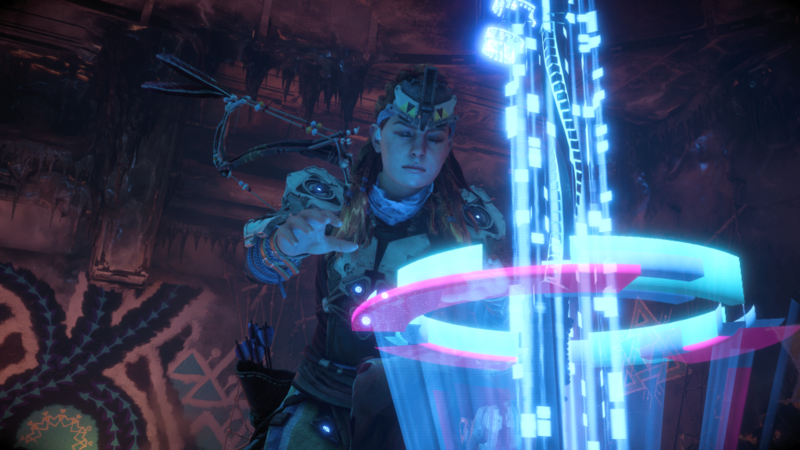 Here Aloy gets a whole new environment to play in, new enemies to defeat, and a new traveler skill tree. This has some great quality of life additions like being able to pick up items on a mount or a jumping attack dismount. She will also come across new armor and some new weapons, though nothing that stands out or really seems like a necessary addition, if only just some new toys to mess with. Otherwise playing the Frozen Wilds will feel similar as it did with the base game. It retains its fluid controls and ease of use, so it wasn’t long before I was taking down robot dinosaurs once again with ease, except for the newer enemies. These guys are fast, hit hard, and really take a beating. Intimidating and perhaps sometimes in players face a bit too much, I otherwise loved how much I had to keep on my toes around them. Another new addition is towers that will replenish all nearby enemies health, so it’s best to take them down ASAP, otherwise the fighting will be for nothing. It’s an interesting game of stealth, sneaking up to them and taking them down without getting noticed. The only major issue with the new enemies I had is feeling as if they never give players room to breathe, it’s simply stay as far away as possible, dodge and unload on them as fast as possible. Visually, the game is a looker just like at release, only now with a lot more snow. 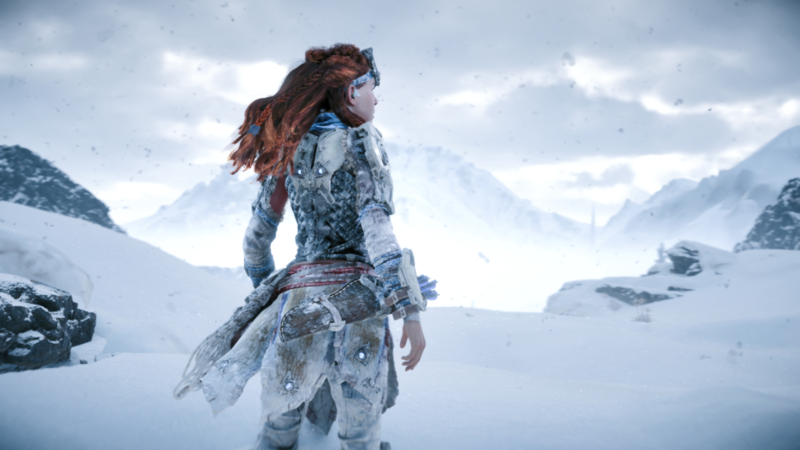 The particle effects of the snow, just swirling in the air, moving at Aloy’s feet look great and makes Aloy shaking in cold that much more believable. This DLC exclusive region is no stranger to the rest of the game’s beauty and wonder, and only adds to the great feeling of exploration once again. Voice acting is great again and characters that interact with Aloy do seem to display more emotion and better facial animations this time around. The Frozen Wild is a great DLC that takes the core game, makes some new additions, and gives player a reason to return to the world in great form. There isn’t much here to really persuade anyone that wasn’t hugely into Horizon, but that’s usually not the case for DLC additional content. While it might not have the same initial wow impact as the first time, it makes returning here much more incentive.